We are a recognized and reputed name in the market, successfully engaged in manufacturing and supplying the best quality array of MIG Welding Machine like inverter based MIG welding machine, diode based MIG welding machine, etc. The offered welding machine is used in welding through an electric arc between work piece and consumable electrodes. Our team of skilful professionals manufactures this machine as per market standards using premium quality components and state-of-the-art techniques. In addition to this, our offered machine is made available in several specifications to satisfy the needs of our clients. 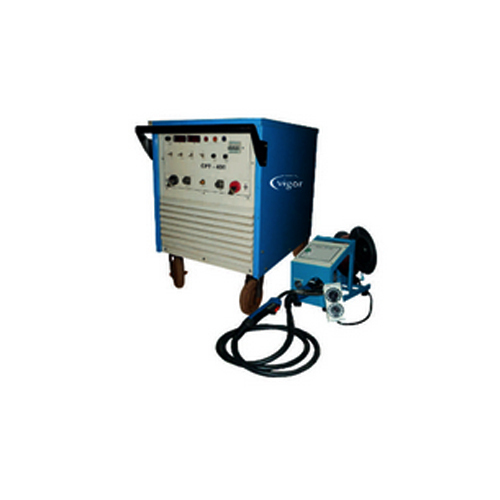 Moreover, our clients can easily avail this MIG Welding Machine from us at rock-bottom prices. Vigor Welding incorporated in 2014. We are an ISO 9001: 2008 Certified Company. We are Manufacturer, Supplier and Trader of Inverter Based Welding Machine, Diode Based Welding Machine, Transformer Based Welding Machine, Cutting Machine, Welding Accessories, Testing Equipment, Energy Meter and Power Tools. These are energy efficient and widely used by transformer manufacturers, infrastructure companies, blower manufacturers, automobile industries, power projects, foundries, shipbuilding, pipelines, light and heavy fabrication.